Srinagar,Dec 24: The poll turnout euphoria that was witnessed during the earlier six phases of polling in Kashmir disappeared on Wednesday as Srinagar maintained its record of lowest poll percentage. 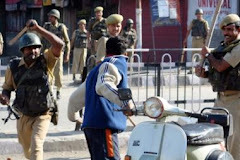 Tough security restrictions to facilitate the last phase of elections for eight seats of Srinagar saw people cursing themselves for having chosen the city as their abode. “As if it was a punishment for being in the capital city,” said an anguished resident, Abdul Hameed who had decided to vote but did not after the City was put under virtual siege forty-eight hours before the polling began Tuesday morning. There were no frenzied voters and long queues that were earlier seen in Bandipora, Ganderbal, Baramulla, Kupwara, Budgam, Islamabad, Pulwama, Kulgam and Shopian. 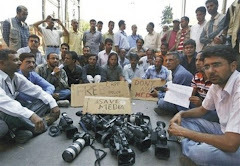 Unlike previous occasions, the mediamen had to locate the voters to have their bytes.Srinagar witnessed large scale anti-election protests and police and paramilitary, who were deployed in strength across the city, faced tough time in quelling the demonstrations. The boycott call of separatists, which was more or less not respected by people during first six phases, was totally effective on Wednesday as most of the people stayed away from poll process and preferred to stay indoors. The seventh and final round of polls also witnessed scattered clashes, fake voting, and poor turnout in many parts of Srinagar, where 152 candidates were in the fray from eight constituencies. The Elections are over now and soon a new Government will be in the saddle but the moot question is what will happen after the elections in Kashmir?, writes M Ashraf. The recent elections held in the State threw up many surprises. Firstly, against all calculations and assessments, there was appreciable voluntary participation by the people. The call for boycott had very few takers. No doubt the Hurriyat and other leaders who had given the call for boycott were detained, placed under house arrest, and physically prevented from canvassing for the boycott through countless declared and undeclared curfews, yet the turn out of voters demonstrated that the people had made their own decisions in regard to participation in these elections. They had a very strange argument. The elections were for good governance and “Azadi” was a separate issue. They wanted both, good governance and “Azadi”. 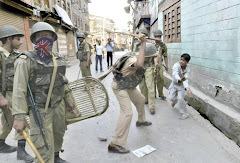 Several theories are being advanced for this npredictable behaviour of Kashmiris. The behaviour has been classified as two extremes, a revolution seeking salvation on one hand to a mass suicide on the other! 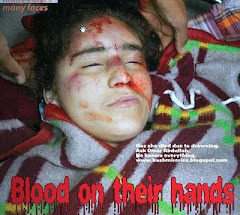 Some say Kashmiris have always been unreliable, cheats, liars, selfish, timid, cowardly, and so on. Many foreign authors, explorers, and travellers are quoted for these unhealthy attributes of a Kashmiri. Moorcroft, Sir Walter Lawrence, Tyndale Biscoe, and others are supposed to have pointed out this behaviour in the writings about Kashmir. However, these writings have been quoted out of context. 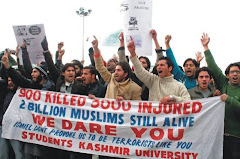 No one has pointed out that these authors have also stated that this behaviour of Kashmiris is because of their urge for survival drilled into their psyche after centuries of external subjugation. People have been pinning for “Azadi” for centuries, and “Azadi” for a common Kashmiri means complete and total emancipation. Even the present struggle is more than half a century old! The failure of the boycott leaders can be attributed to their inability to convince people about the blueprint for “Azadi” projected by them. In fact, they have neither a clear definition of “Azadi” nor a blue print to achieve it. Everything is abstract and vague. 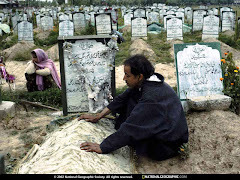 Kashmir’s greatest misfortune has been the vague and wavering leadership. One cannot preach “Azadi” sitting in posh bungalows, riding luxury four wheel drive vehicles, and enjoying all the goodies of life to a people facing all the hardships of day to day living. It is true everywhere. The Mumbai attacks can be taken as a parallel. As long as the common people in India faced various terrorist attacks, the intellectuals, the elite, the media controlled by the elite did not bother too much. It was only when the elite itself received a direct hit that all hell broke out for the top intellectuals, policy makers, and the media stalwarts (controlled by the elite). 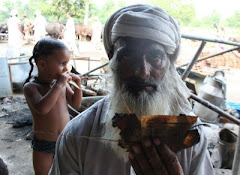 But the common man continued to remain more or less unaffected. In fact, they may be drawing sadistic pleasure from the discomfiture of the upper classes. Right from 1931, Kashmir’s leadership has ditched the common masses at the most crucial periods in their struggle for total emancipation. No one has really bothered to give a practical and a realistic goal of “Azadi”. Mainstream, downstream, upstream, and the separatist or any other type of leadership has always kept its own short term goals in view. They have never tried to ascertain the true aspirations and needs of the people. They have mostly advanced their own aspirations. 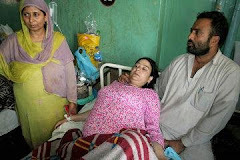 Recently greater Kashmir carried a story about the day to day living of some of the leaders of the popular movement for “Azadi” who have been confined to their homes for last few months. 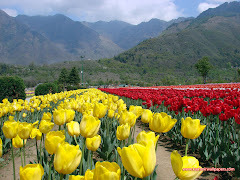 Any common Kashmiri would envy their life style in the present difficult conditions. No doubt there are dozens of other freedom lovers incarcerated in various prisons throughout India but as the proverb goes, out of sight is out of mind! The visible leaders do not seem to impress the common masses with their route maps to “Azadi”. Moreover, the ego clashes coming into open must also be a discouraging factor. If the leadership cannot forge unity among themselves on such an important issue how can they lead others? 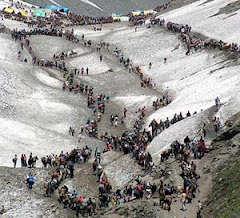 Kashmir must be the only place in history where more than 30 different parties and organisations are trying to lead people to one and the same goal. Normally all such freedom movements in history have had a single leader and a single party to guide and lead it to the final goal. It is only after the goal is attained that political parties mushroom to take over the governance. Here, we have a political struggle for leadership going on even before reaching the goal! This must have made “Azadi” look like a very distant goal for the common people. So much for the “Freedom” camp. As regards the “loyalists” and the “developers”, they have been in the business of “development” for over half a century. Instead of projecting peoples’ aspirations, they have been looking after their own aspirations. They have always had a one point programme. How to make hay while the sun shines? In the process of developing people, they have fully developed themselves. There has been no limit to the funds for development made available by the Central Government. So far over a couple of hundred thousand crores must have been pumped into Kashmir. This does not include the funds pumped in by various agencies on both sides of the divide. If all this money had truly gone into development and for the upliftment of the poor, Kashmir should have by now been the best welfare state in the whole sub-continent. It would have truly become the Switzerland of Asia or the Eden of the East! A Kashmiri has been continuously facing a dilemma. He has been trying to get the both, the good governance and the illusive “Azadi” and in the process he has got neither! His recent behaviour regarding both the massive upsurge for “Azadi” and the unprecedented turn out for voting is simply a revolt against the entire leadership whether for ultimate freedom or for development. This has confused all. The political pundits and the forecasters, the pro-freedom sympathisers and the mainstream advocates. Let us forget all confusing situations and insoluble puzzles. There has been an election and a government would soon be in the saddle but the question is what will happen then? Will the government which takes over the reins of power be able to deliver the good governance the people have voted for? Will they be able to fulfil the promises they have made to the people? They have been promising more than the moon! The infrastructure, the employment, and above all the cessation of harassment and humiliation. Keeping in view the past experience it is not difficult to hazard a guess. The broth will not be any different when the cooks are unchanged! We may give them new names, new clothes, and even new implements but they will do the same cooking they have been doing for decades unless they get a new innovative Chef who means business. If this does not happen, the people who had been coming forward in hordes upon hordes to cast their votes will again get disillusioned and the leaders propagating “Azadi” will try to be back in business. However, this time they may have stiff competitors. The youth brought up by the conflict of last two decades will challenge them. They are capable of even leading the traditional leaders as was demonstrated during the last upsurge. They are tough, hardened, dedicated, and unrelenting. If they go into the mode of “Azadi”, it will be a difficult situation for all. 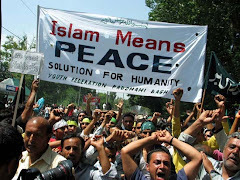 For peace to prevail something dramatic must visibly happen and that too very soon. Otherwise we may be in for a “hot” summer next year! Srinagar, Dec 24: Widespread boycott of polls and more than a dozen protest demonstrations coupled with complaints of ‘mobile and bogus’ voters marked the election in the old city, a trend inverse to surprisingly high turnout in first six phases of the elections. People who boycotted the polls said there is no substitute for right of self-determination. Most of the polling booths in the Old City wore a deserted look as people boycotted the elections and staged anti-election protests. 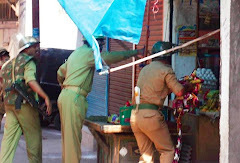 With heavy deployment of troopers in lanes and bylanes, curfew like situation prevailed in Bohri Kadal, Rajouri Kadal, Nowhatta, Khanyar and its adjoining areas. Pertinently, the Old City has been nerve centre of pro-freedom demonstrations and violent clashes during the past five months. 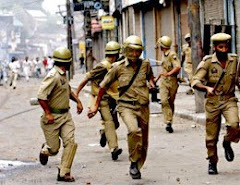 At least five youth have been killed and hundreds injured by the CPRF troopers and police during these clashes in Nowhatta and adjoining localities. In the morning, hundreds of people took to streets at Tankipora near deputy commissioner’s office and staged pro-freedom and anti-election protests. “We want freedom,” the protesters shouted. 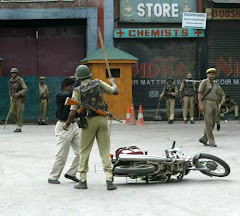 However, troopers swung into action and used force to disperse the protesters, injuring at least five persons, including nine-year old Sahil Bhat and photojournalist Abid Bhat. The locals alleged that after the incident, the troopers detained many youth and ransacked residential houses there. 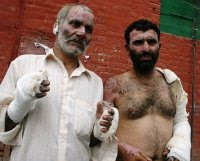 “It is our right to boycott the polls and nobody can force us to vote,” said Ghulam Ahmad of Tankipora. 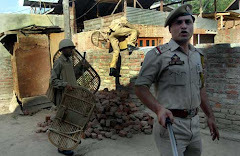 A police sub-inspector guarding a polling station in Saraf Kadal, a stone’s throw away from Hurriyat chief Mirwaiz Umar’s ancestral residence, told these reporters there was no need to enter the station and inquire about the details of voting. “Two voters turned up so far,” he said. The polling staff of the four polling booths inside the station said that of total 2245 voters only two have been polled by 1.45 PM. At polling booth number 25-Naqashpora, only three people out of 1038 had cast their votes till 9 am while in 23-Sathu Balla Barbarshah, a single vote out of 904 had been polled in the first one hour. None of the 25 odd polling agents had turned out at the polling station in Animal Husbandry Department’s office near KMD Bus stand, not to speak of the voters. At 5-Reshi Mohalla, Habbakadal, three votes had been polled out of 593 in the first two hours of polling while in 22-Malik Bagh, no voter had turned up till 10 am. However, moderate polling was witnessed at 54-Shahampora in Nowhatta area of Khanyar constituency where 190 voters out of 833 had cast their votes till 11:15 am. Similar was the case with 52-Tujgari Mohalla where 183 people had cast their votes out of 700 till 11:35 am. Some people were also waiting in queues outside these two booths. In Rainawari area’s 39-Naid Booni station 52 votes had been polled out of 601 till 12:25 pm while at 40-Naid Yar only 26 voters out of 1010 had turned up till 12:30 pm. The local residents of these areas said that only a few workers of political parties and fake voters brought from other areas voted. At 42-B Nowpora polling booth, out of 485 votes only 17 votes had been polled till 1 pm. In its adjacent 41-A Nowpora polling booth, 59 votes had been cast out of 642. “We can’t do sell-out of blood of thousands of youth who sacrificed their lives for freedom of Kashmir,” said the residents of Nowpora. In Miskeen Bagh area inside polling station number 47, 311 of the total 907 voters had voted till 1.20 PM. Here also some local residents claimed that a particular political party used mobile voters. But the situation was entirely different at 13-Anderwari Khanyar where only four votes had been polled out of 364 till 1:30 pm. At 24-Kadi Kadal, no voter had turned up till 1:35 pm. The booth had 774 registered voters. Similarly, in 20-Chandpora lone voter had cast his vote out of 568 electors. 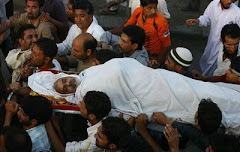 “He was the polling agent of National Conference,” a polling staffer told Greater Kashmir. At 22-Saraf Kadal no vote had been cast out of 464 till 1:40 pm while one vote had been polled out of 439 at 21-Tanki Mohalla till 1:42 pm. 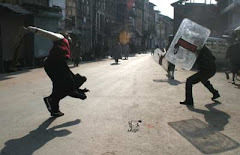 Witnesses said the locals attacked the mobile voters at Wantpora with firepots and stones forcing them to escape from the spot. 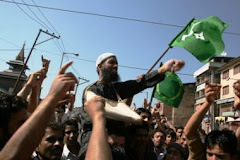 Witnesses said angry youth attacked the cavalcade of NC candidate for Eidgah, Mubarak Gul with firepots and stones when he visited a polling booth at Pather Masjid. Till afternoon, only 27 votes had been polled out of 297 at 7-Naquashpora polling booth. “He (Gul) offered us money in lieu of casting votes in his favour. 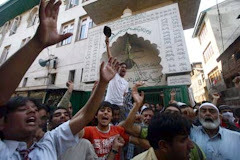 We threw Kangris at him and his hooligans,” the angry locals said. “Elections under the Constitution of India is not acceptable to us as we don’t consider as Kashmir as its territory. We want plebiscite and our boycott should serve as an eye-opener for the world,” the locals said. In Nawab Bazar locality people knew that three votes out of a total of 700 votes had been cast by the local NC leader and his family. “We were keeping an eye on who will vote; mobile voters have not dared to come here,” said Ashiq, a local youth. In nearby locality of Qalamdanpora, people said four or five votes have been cast by the “polling agents” of political parties. 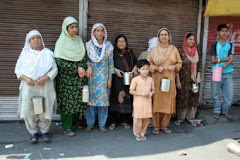 They said the locality has boycotted the elections for freedom. “You saw those five men entering the station for voting; they are drug addicts and they have been given charas and some cash,” said a group of youths. The polling of the two stations said that out of total 1175 voters only 8 votes were polled by 2 PM. Near Nawa Kadal Degree College, people exchanged heated arguments with NC activists outside a polling booth there. “Your party has always exploited the Kashmiris. 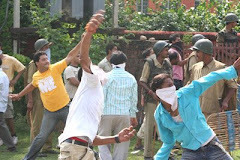 You are traitors,” the angry people shouted at the NC activists. To prevent the situation from escalation, the troopers rushed to the spot. The people in native locality of chairman of Jammu and Kashmir Liberation Front, Muhammad Yasin Malik boycotted the elections and took out an anti-poll rally. “We have boycotted the polls, however, the mobile voters cast 7 votes in the polling booth here,” the residents said. 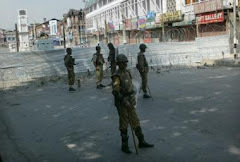 Later the JKLF activists tried to march towards Lal Chowk. However, they were intercepted by the troopers and beaten by the batons. 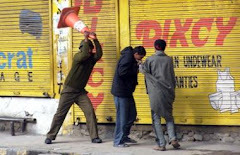 Anti-election protests were also held at Fateh Kadal, Chiunkral Mohalla, Eidgah, S R Gunj, Mallrata, Aali Kadal and Khaiwan Malpora tried staging anti-election protests. 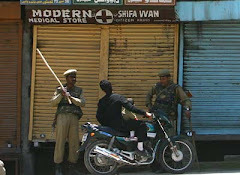 However, policemen and paramilitary CRPF troopers used force to quell the protesters and chased them away. 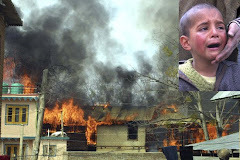 Later in the evening, residents of Gager Masjid, Zaina Kadal alleged that CRPF troopers broke down windowpanes of several houses. “They avenged our boycotting the polls,” they complained.